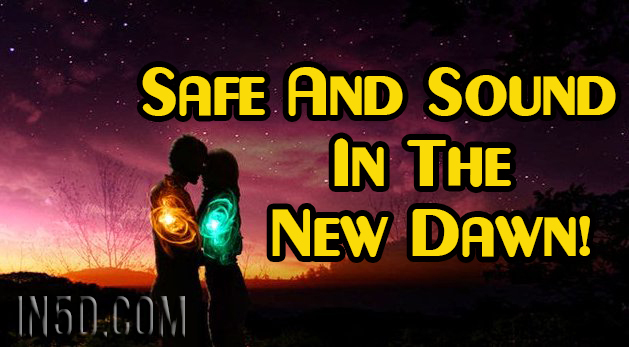 Safe And Sound In The New Dawn! Waking to a new dawn every day is a blessing and one which we truly appreciate. So our day begins, and we can give a quick review of where we are at, as we snuggle up to the energies. What are we feeling? Safe and sound in our own vessel and being. A true I AM presence. It is at this very moment where we can take stock of our own energy, and feel its full potential. There are many who are experiencing bouts of tears, doubts, and worries about where they are heading. In fact, it is the letting go of our perceptions of all that is, which is necessary for moving forward. We are safe and protected as we embark on a new adventure, one which is reminiscent of our younger days. My interpretation of this that we have reached the balance of the mind, body, and soul. We are in some way, co-creating a new relationship with our self, and for this, we are learning, as we did as teenagers. Perhaps this opportunity to reacquaint yourself with the inner child that was left behind a long time ago. With any new relationship, there will be a series of trying new things. Much the same as starting a new job; we learn as we go along. We gather more confidence as time passes, which reflects in our interactions with others. Is anything stopping us from moving in the new? Perhaps an old thought or preconception about how things should be? This particularly applies to those who believe they are on a Twin Flame journey. What exactly are you holding on to? Is it an old image of your Divine counterpart? If we look at ourselves we are most definitely in the new, therefore, so is our counterpart. When we look at this journey of life, we have all experienced a broken heart, we have all overcome grief and loss. It is an inevitable part of life. When we look at what wonderful gift our Divine counterpart gave us – love. A love so powerful that they let us go, knowing themselves how painful it would be. They left an imprint for us to remember, and one that many of us did. We took this opportunity to wake up and find out who we are for real. Can we take a minute to really appreciate them and where we are at now? There shall be nothing but love and respect for them, for it is them who has led us to the pastures we find our self in today. About the author: Deane has created unique personal development programs for those who are awakening and wish to make a smooth transition to the new templates. He has a passion and in-depth understanding of past life memory, its interpretation and how to address this in current life. To understand who we are today, we need to get to grips of who we have been – through unraveling the truth within, we can create a new template for the way we live our lives – in truth! You can find more of his work on https://askdeano.com.